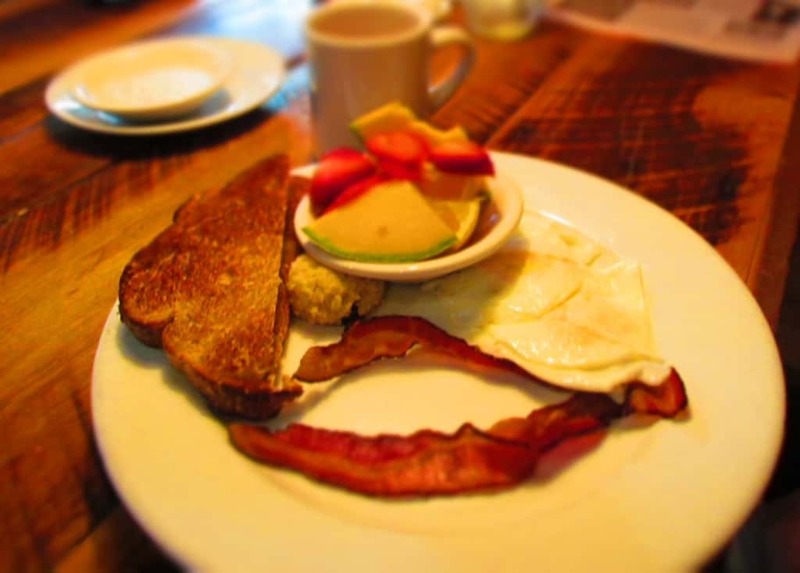 Finding breakfast foods in Gatlinburg, Tennessee is about as easy as falling off of a log. It seems like every other restaurant is dishing up some sort of country eats. With a day of Smoky Mountain hiking planned, we needed something that would stick with us and fuel our morning. Those early settlers in the region started their day with hearty meals, so we looked for something similar. One of the most visually appealing spaces on the strip is just a couple of blocks from the national park entrance. 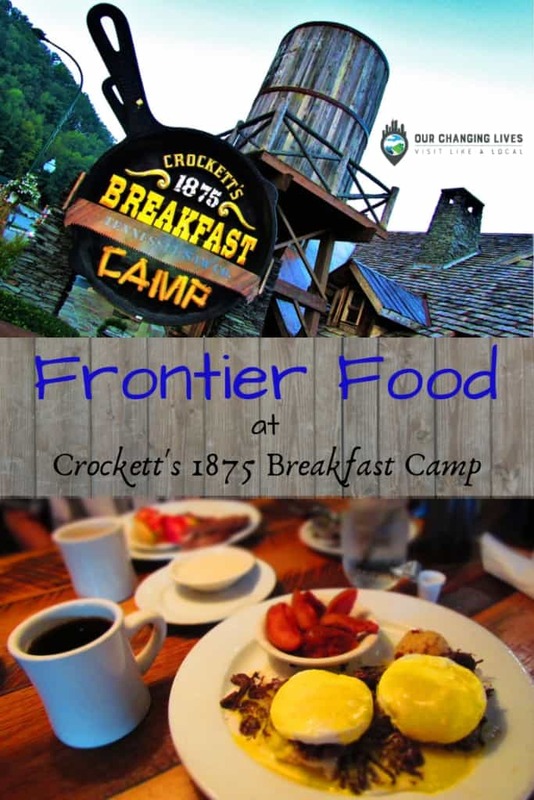 We were hoping to find frontier food at Crockett’s 1875 Breakfast Camp. The outside certainly evokes the idea of an old mountain camp, and stepping through the door kept the theme going. 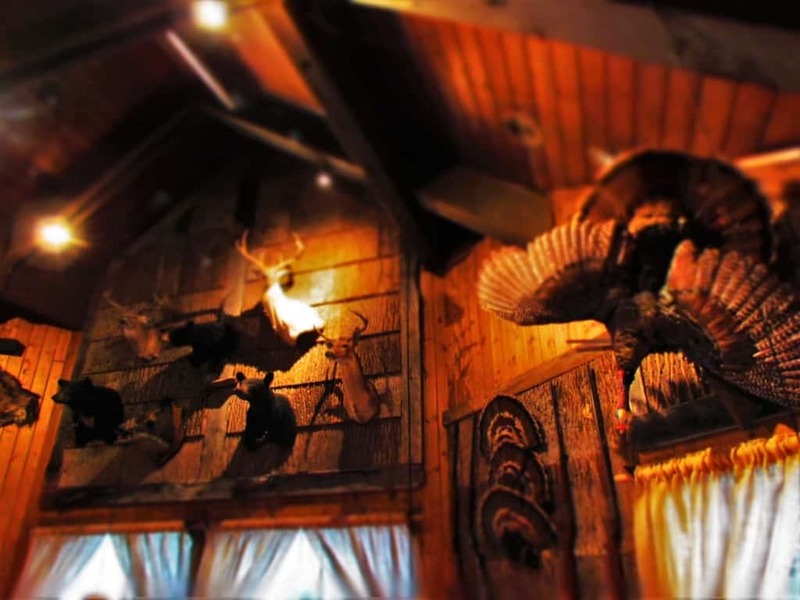 The restaurant is named for local legend, David “Crockett” Maples. The frontiersman served in the Civil War, where his company helped protect the Appalachian region. He returned to the Gatlinburg area to operate a supply store with his wife, Mary. At times, Mr. Maples would serve as a mountain guide for visitors, which led to his near demise. A blizzard left him stranded and he nearly froze to death. 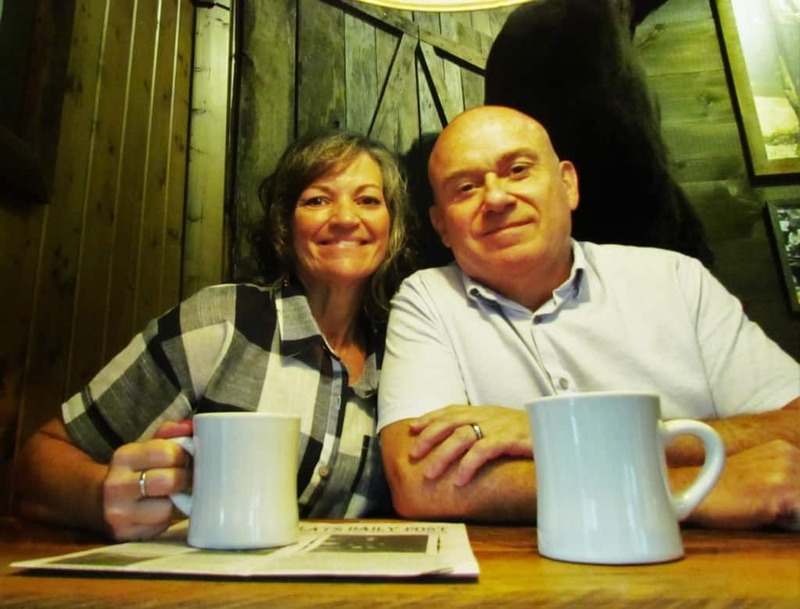 Severe frostbite cost him both feet, but that didn’t stop David Maples. “Crockett” created a pair of boots with wooden feet. He secured these to his legs and was able to get around with a pair of canes. With the mobility issue solved, he was able to continue his active life until his death at the age of 88 years. When you make your stop at Crockett’s Breakfast Camp, you will want to give a nod to the statue of Maples that can be found outside. Back inside, the smell of frontier food had our appetites revving. After a quick look around, it was time to sit down to a hearty breakfast. Crystal decided to sample some standard campside eats. Eggs, bacon and toast would provide her fuel and the side dish of fresh fruit was a great compliment. An unexpected treat was a dollop of Cherokee Sweet Corn Pone. This delectable, sweet substance is a mixture of corn meal, sugar, butter, and water. While the recipe sounds simple enough, the end results are out of this world. Good thing they ration this stuff, because you can have too much of a good thing. I was feeling much more ‘”out of the ordinary” for my order. For the past couple of years, I have had a hankering to test out as many Eggs Benedict dishes as I can find. Crockett’s has a plate that puts the frontier food spin on this classic dish. 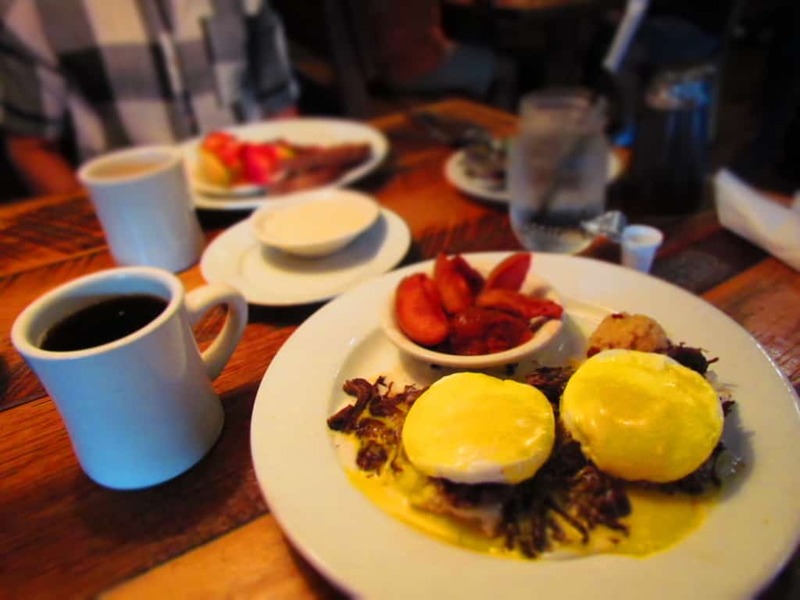 The Signature Corned Beef Hash Benedict starts with an English muffin and ends with their homemade hollandaise sauce. In between, they load a healthy helping of corned beef, which they top with two poached eggs. A side order of baked apple slices added a sweet, cinnamon touch to my meal. During our visit to Gatlinburg, we had come to realize that there are an abundance of pancake places. 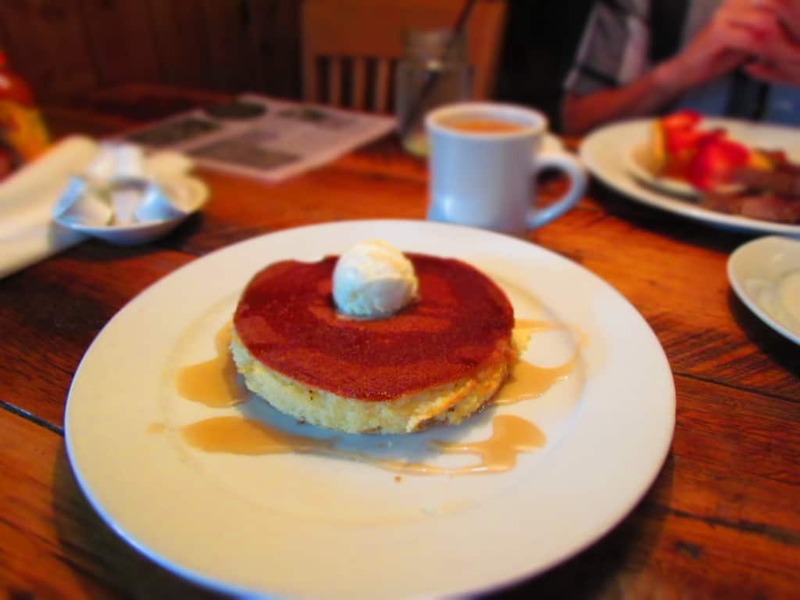 We had already tested a few, and decided that we will be compiling a pancake plethora article in the coming weeks. In the meantime, it was our turn at the Thick Aretha Frankensteins Pancake. The manager sent one over for us to sample, and we were blown away by its size. We found out that it is baked, instead of being whipped up on a griddle. The texture was so airy that we kept nibbling away at this monstrous creation. After filling our bellies, we took a few extra minutes to nurse our coffees. These extra moments gave us time to walk through the days itinerary. We knew that the recent rains would make some of the trails less than pristine, but it wouldn’t stop us from exploring a region we had waited so long to visit. With plenty of fuel from our frontier food, the day was ours to seize. Time to hit the trails and make the most of our day. What do you think of the tale of David “Crockett” Maples? Share this article with a Frontier Food fan! It certainly was delicious. Crystal is interested in learning how to make the huge pancakes. What a fun read! I love the history and the food looks so delicious! Glad you enjoyed it. It was delicious. I love restaurants with a bit of history. 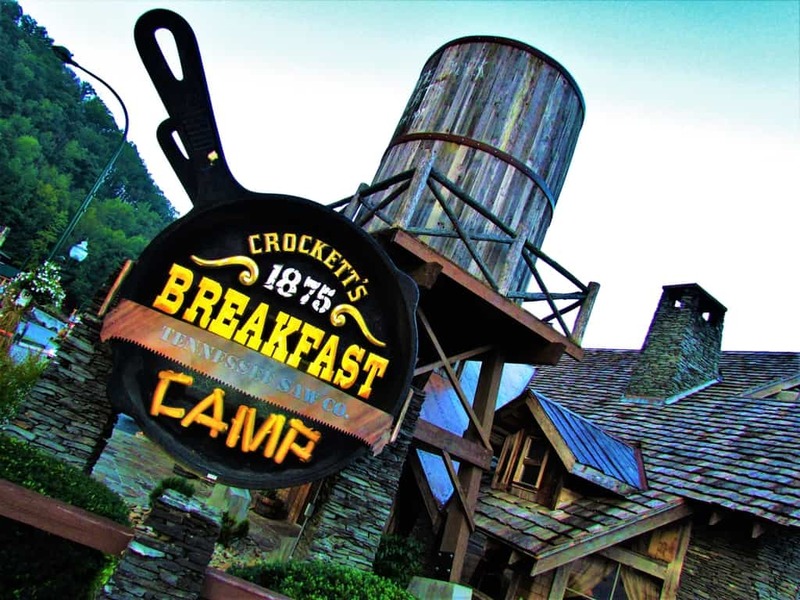 I can imagine those frontiersmen needed lots of food to keep them going, and it looks as if Crocketts is keeping the tradition alive! It certainly is putting the food out there for guests to enjoy!